A few years ago, I wrote about Wild Turkey’s 81 and Russell’s Reserve 6 Year Rye. 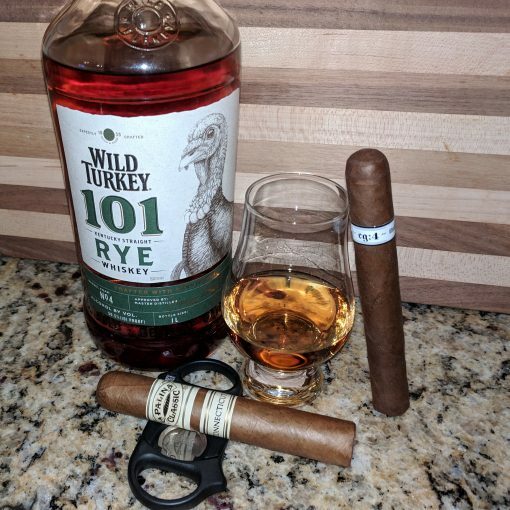 At the time, I noted that “Wild Turkey also sells a 101-proof rye, but it’s limited in quantity, available only in certain states, and reportedly only comes in one-liter bottles.” Today we look at that offering. The good news is, anecdotally at least, 101 Rye seems to be getting easier to find than it was only a few years ago when Wild Turkey announced it was limiting 101 Rye to certain states and only one-liter bottles. One of the changes in the shift to only one-liter bottles was an increased price, with bottles selling for around $40 each. Wild Turkey uses a mashbill that just barely qualifies as rye (which needs to use a majority of rye) with 51% rye, 37% corn, and 12% malted barley. While this is a classic rye recipe, it is at odds with the high rye trend that has become increasingly popular, especially with the 95% rye recipe made by MGP Ingredients used by Bulleit, George Dickel, Angel’s Envy, Templeton, High West, Whistle Pig, and others. Wild Turkey 101 is a deep copper color that features a nose of fudge, oak, vanilla, and red hot candies. The palate has honeysuckle, roast corn, light oak l, and clove spices. The finish is where you notice the high 101-proof, with a hint of bubble gum sweetness, menthol, cinnamon, and more oak tannins. Wild Turkey 101’s one-liter bottle is designed to appeal to bartenders looking for rye for use in cocktails, and the rye surely is great in rye cocktails like the Manhattan, Sazerac, or Old Fashioned. However, don’t underestimate this rye neat (or, if you’re sensitive to high-proof whiskey, with a splash of water) as it is a lively, classic, complex rye, similar in many ways to Sazerac Rye, which costs about the same. Pair it with a spicy cigar of any origin, with suggested pairings including El Güegüense, Illusione Original Documents, La Flor Dominicana Air Bender, or CAO Consigliere.